Reading and share top 10 famous quotes and sayings about What Tomorrow Brings by famous authors and people. 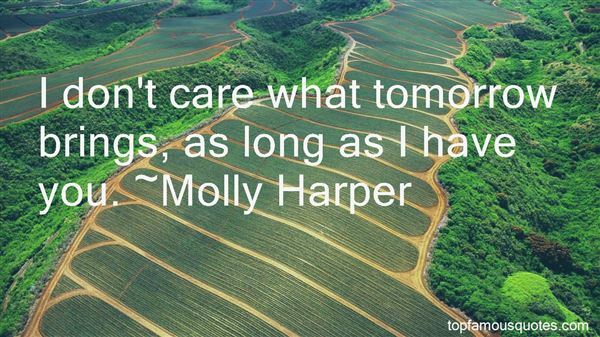 Browse top 10 famous quotes and sayings about What Tomorrow Brings by most favorite authors. 1. 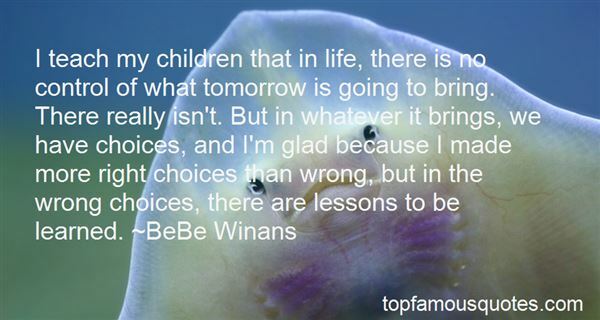 "I teach my children that in life, there is no control of what tomorrow is going to bring. There really isn't. But in whatever it brings, we have choices, and I'm glad because I made more right choices than wrong, but in the wrong choices, there are lessons to be learned." 2. "I've gotten to the point that I don't even know what tomorrow brings. When I'm teaching, obviously I'm in town for the class every week." 3. "The proper way is lost to me; my compass spins. I therefore give my entire attention to those works that seem to me most incorruptible: the application of heat, the proportion of seasoning, the arrangement of a plate. When robbed of all pretensions and aspirations, with no proper home nor any knowledge of what discord tomorrow brings, I still may have a pocketful of dignity. The Roman pomp and raiment have fallen away, and I see at last the glory of washed feet and shared bread." 4. "Bob's Words:Nobody knows what tomorrow bringsBy loving, giving, caringAnd sharing todayLets one know that if tomorrowDoes not comeToday is a good day to be the last"
5. "Fear is always in relation to something; it does not exist by itself. There is fear of what happened yesterday in relation to the possibility of its repetition tomorrow; there is always a fixed point from which relationship takes place. How does fear come into this? I had pain yesterday; there is the memory of it and I do not want it again tomorrow. Thinking about the pain of yesterday, thinking which involves the memory of yesterday's pain, projects the fear of having pain again tomorrow. So it is thought that brings about fear. Thought breeds fear; thought also cultivates pleasure. To understand fear you must also understand pleasure – they are interrelated; without understanding one you cannot understand the other. This means that one cannot say ‘I must only have pleasure and no fear'; fear is the other side of the coin which is called pleasure." 6. "Lonesome. Lonesome. I know what it means. Here all by my lonesome, dreaming empty dreams. Weary. Weary at the close of day, wondering if tomorrow brings me joy or sorrow." 7. "I don't care what tomorrow brings, as long as I have you." 8. 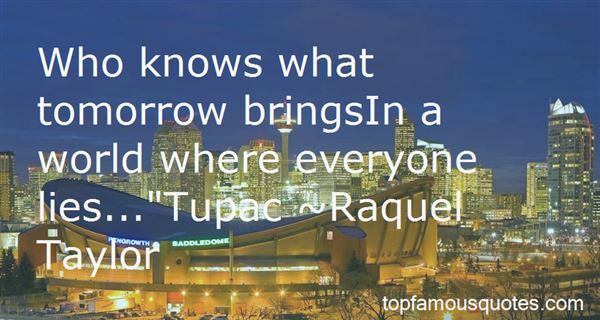 "Who knows what tomorrow bringsIn a world where everyone lies..."Tupac"
9. "I stand at the foot of the cross, knowing I must lay my body down before You. I want to be willing to become a vessel that You can use through whatever circumstances You allow. Like so many other times before, it's in my suffering I see and share in Your glory. And isn't that what I was made for? Like Jesus, I want to be a reflection of Your glory, a representation of who You are. Father, make me a willing vessel to surrender and rest in You no matter what. I pray that You will keep my heart in perfect peace, because my mind is steadfast as I trust in You. No matter what tomorrow brings, may You find me faithfully available to lay it all down before You as a sacrificial offering of praise." 10. "Only a female could be as calculating and have the foresight that destiny requires,' the gypsy explained. 'Now fate is a man,' he went on, 'no planning, just go with the flow and see what tomorrow brings." You're my life, Elle. When we have our children, they'll be included in that circle and I'm not a man to lose everything. I want you as safe as possible. ""So you don't think three protection dogs, a room filled with weapons, a panic room and house that eats people isn't just a little overkill?"